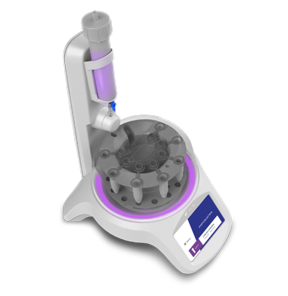 Izon Science, the world leading manufacturer of nano-biological separation and characterisation tools, today announced the release of its first Automatic Fraction Collectors (AFC) for the qEV SEC column range to beta customers this week. The release heralds a new era in exosome and all extracellular vesicle (EV) isolation. “The AFCs neatly solve the problem of scalability and repeatability of EV isolation in research, product development and clinical use,” says Hans van der Voorn, CEO of Izon Science. Izon’s AFCs use a very precise method of measuring the volume of fractions. The size and number of fractions can be easily optimised and programmed by the user to maximise the purity and yield of isolated EVs. As a result the user is freed up to do more important work while the AFC performs its tasks. Van der Voorn says one of the key drivers for the AFCs has been the need for worldwide standardisation of EV isolation, measurement and analysis. “Izon Science views the current situation as a signal to noise problem, where the “noise” is the random variation caused by non-repeatable methods. For instance, ultra-centrifugation has been commonly used in EV research but is not scalable or repeatable without introducing random variations in the sample collected. We expect the use of the AFC + qEVs to quickly make ultra-centrifugation obsolete in the EV world,” he says. The AFC will use “smart” columns in a world first application of RFID technology. Izon Science has designed and developed an RFID reader/writer for the AFC. Each qEV column will have an RFID tag with addressable memory, which will store column parameters, production and QA data as well as usage data including the number of uses and cleaning cycles. The use of electronic data capture is particularly relevant for large scale biomarker analysis trials. Further development of this capability is expected to occur with detailed input from users and regulators. Izon Science’s introduction of SEC columns, in particular the qEV range by, was a significant advance for the EV field in 2014, offering the cleanest EV samples available at that time. They were first developed by the Academic Medical Centre in Amsterdam and subsequently developed for worldwide sale by Izon Science Ltd.
“The current introduction of automation and high precision for the qEVs is an equally important advance, enabling the scale up potential that the field badly needs, with a significant improvement in quality at the same time,” adds van der Voorn. A limited number of beta versions of the AFC are being offered to existing customers now, with a free upgrade and much wider availability of the full version 1 release due in early May. For further information visit www.izon.com or email . Izon Science is the world leading manufacturer of nano-biological separation and characterisation tools. Its qEV SEC columns have rapidly become the EV separation method favoured by experts. Izon’s TRPS measurement system is the only accurate, standardisable and practical method of measuring complex nano-bio particles, particularly EVs and nanomedicine products. Over 960 organisations use Izon’s technology globally and it has been featured in 400+ academic publications.